Learn Shorinji Kempo, a modern Japanese martial art with our classes near City University. Shorinji Kempo is a balanced system of self defence and martial arts training. 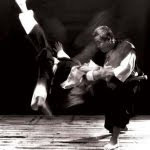 Based on ancient Chinese fighting arts and spiritual practices, it teaches cooperation and self development as well as physical self-defence techniques. So if you want to learn practical self-defence in fun and safe environment, come and join us at any of our regular sessions. Beginners are always welcome. It was great to meet so many of you at Fresher's Fair last week. So if you are ready for a great workout and to equip yourself with some self-defence skills, come and claim your FREE trial at one of our classes over the next few weeks. Looking forward to seeing you soon for a proper introduction to Shorinji Kempo! ©BSKF City University Branch, 2012, all rights reserved. BSKF is an independent, not for profit organisation which exists to support its members in the practice of the art. BSKF is not affiliated to, nor has any association with the World Shorinji Kempo Organisation.